Content Warnings (highlight to read): Frequent but not super graphic murder & violence. Recreational drug use. Discussions & ideation of suicide. Very morally ambiguous protagonists. Description: A “classic melodrama of manners” where disputes are settled with sharp blades and sharper tongues. 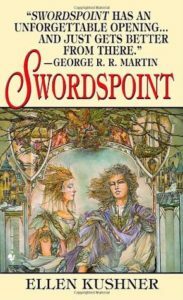 Swordspoint follows an interweaving set of characters and perspectives in a struggle for political power in the world of Riverside: Richard St Vier, an excellent swordsman but not much for conversation; Alec, his sharp-tongued lover with bad habits and worse ideas; Michael Godwin, a young lord who finds himself involved in games over his head; an elegantly powerful Duchess; and the rest of an engaging and largely morally ambiguous cast.